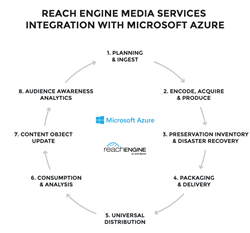 Levels Beyond, which delivers supply chain media inventory to the world’s leading media companies announced the release of Reach Engine Media Services, built on the Microsoft Azure cloud platform. Reach Engine is now integrating and operating on Azure Storage, supporting complete media services and especially archive operations. In future versions, the breadth of Reach Engine Media Services (see diagram) will be integrated with Azure Media Services to include: VOD Encoding, Streaming, Content Protection and Analytics services. Reach Engine’s Supply Chain automation has years of depth, breadth and connections to service most any media organization. “Reach Engine Media Services woven in and around Microsoft Azure brings any organization all the infrastructure they need for massive, distributed VOD, SVOD, live or on demand need,” shared Art Raymond, CEO of Levels Beyond. Levels Beyond is the Denver-based company behind the software platform Reach Engine that allows companies to create and curate video content on new era tools and enable smart, secure and elastic cloud services in sync with media workflow and supply chain automation. With Reach Engine, Levels Beyond has created an evolvable and customizable system serving more than 80 tier 1 clients internationally to create innovative solutions that advance media businesses. http://www.reachengine.com.